The Great Pyramid of Giza is the oldest and yet the only existing monumental specimen among the seven ancient wonders of the world. And the extant structure’s ‘old age’ of over 4,500-years is now redefined by the oldest ancient Egyptian writing on a papyrus. To that end, a set of papyri was discovered in 2013 (by a French-Egyptian team) near Wadi el-Jarf port, 15 miles south of Zafarana, a town by the Gulf of Suez. 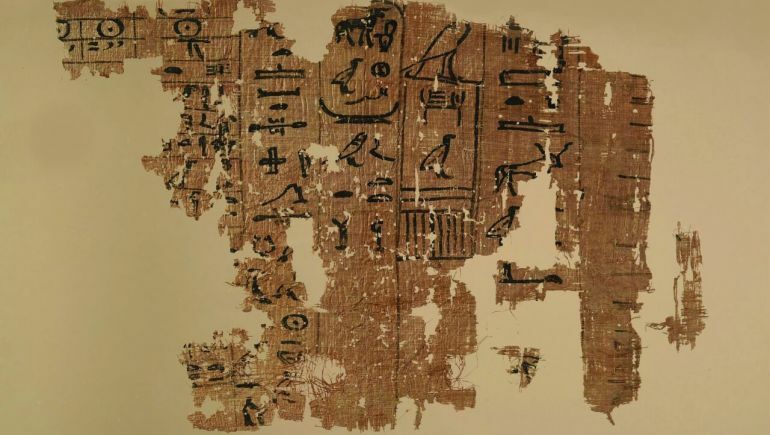 According to Egyptian antiquities ministry, these papyri detail various parameters related to the construction of the Great Pyramid of Giza, while incidentally providing the first known examples of ancient Egyptian writing. The logistical factors detailed in the papyri entail various scopes, including the daily lives of the ancient port workers who were responsible for transporting huge limestone blocks. In fact the massive ambit of the Great Pyramid translated to the use of a whopping 2.3 million stone blocks (ranging from 2 to 30 tons) – that comes to an average of 800 tons of stones being installed each day, with 12 stones being precisely placed every hour! It gives for every day an account of the work of this crew transporting limestone blocks from the quarries of Turah on the east bank of the Nile to the Pyramid of Khufu at Giza plateau through the Nile and its canals.